My name is Wylie Young and I am 12 years old. I just finished my sixth year in the North Osage 4-H Club. I enrolled and was active in three projects: Leadership, pets, and visual art. I also held the office of parliamentarian in our club. This was my first year in the leadership project. At regional club days, I learned how to be a room monitor. 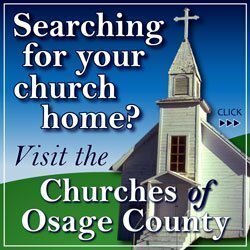 I also attended Osage City fair board meetings and learned what it’s like to plan the fair. During the fair, I was the junior superintendent for the 4-H and open animal costume contest and helped run the concessions stand at the livestock shows. 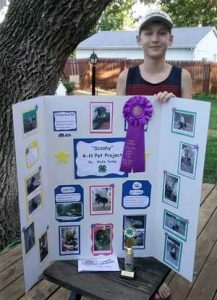 In July, I helped organize the “Osage County 4-H Pet Project Workshop”. It was held at my house. I gave a demonstration on my chinchilla, Vader, a project talk on my dog, Scooby, and gave a tour of my backyard pets. I stayed busy doing my pet project all year long. I did a project talk on my dog, Scooby, at county club days and did a demonstration on “How to prepare for your new chinchilla” at county club days, regionals, the Franklin County Spring Fling, and the Kansas State Fair. 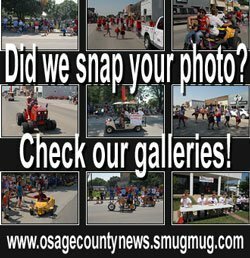 I made an educational poster about Scooby and exhibited it at the Osage City and Overbrook fairs. I have been learning about feral cats and the TNR Program (trap, neuter, release) from my friend Amy Miner. The program helps towns get the feral cat population under control in a humane way. My mom let me adopt a feral kitten born in Scranton. I named him Super Mario. He was scared, had a tummy ache, and a cold in his eyes. He is very healthy now and plays all over the house and even with Scooby. I plan to show Super Mario at the fairs next year, and teach people about the TNR Program. 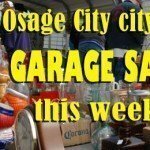 I exhibited visual art projects at the Osage and Overbrook fairs. The key chain I made at 4-H camp got a blue ribbon at both fairs. For the Overbrook fair, I made a 3-D construction Lego display. I called it “Jungle Expedition”. During my conference with the judge, I got to tell her how I made it with paint, hot glue, moss, sand, and rocks out of my mom’s flowerbeds. She was nice and gave me a blue ribbon. Next year I want to enroll in some new projects. I have always wanted to do rocketry. I like to make stop-motion movies with my Lego mini-figures and would also like to learn more about making live-action movies. Two of my favorite things about my 4-H year were going to camp at Rock Springs, and getting to rest in the air-conditioned office during the Osage City fair.